Objective To determine whether self monitoring, alone or with instruction in incorporating the results into self care, is more effective than usual care in improving glycaemic control in non-insulin treated patients with type 2 diabetes. Design Three arm, open, parallel group randomised trial. Setting 48 general practices in Oxfordshire and South Yorkshire. Participants 453 patients with non-insulin treated type 2 diabetes (mean age 65.7 years) for a median duration of three years and a mean haemoglobin A1c level of 7.5%. Interventions Standardised usual care with measurements of HbA1c every three months as the control group (n=152), blood glucose self monitoring with advice for patients to contact their doctor for interpretation of results, in addition to usual care (n=150), and blood glucose self monitoring with additional training of patients in interpretation and application of the results to enhance motivation and maintain adherence to a healthy lifestyle (n=151). Main outcome measure HbA1c level measured at 12 months. Results At 12 months the differences in HbA1c level between the three groups (adjusted for baseline HbA1c level) were not statistically significant (P=0.12). The difference in unadjusted mean change in HbA1c level from baseline to 12 months between the control and less intensive self monitoring groups was −0.14% (95% confidence interval −0.35% to 0.07%) and between the control and more intensive self monitoring groups was −0.17% (−0.37% to 0.03%). 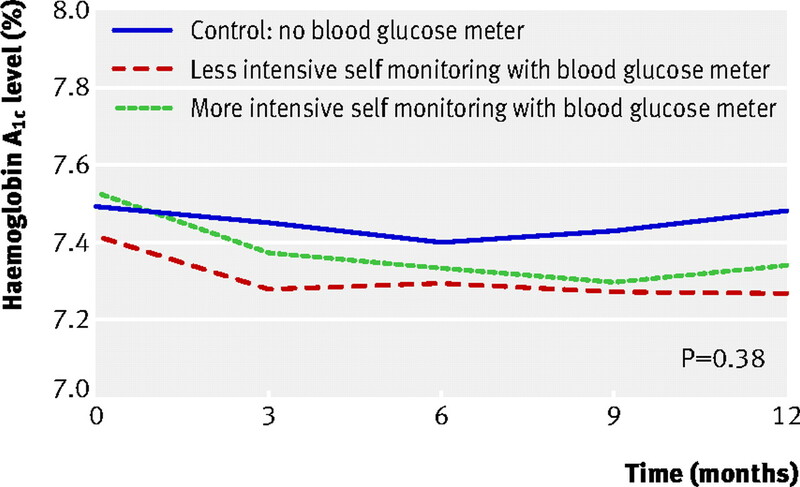 Conclusions Evidence is not convincing of an effect of self monitoring blood glucose, with or without instruction in incorporating findings into self care, in improving glycaemic control compared with usual care in reasonably well controlled non-insulin treated patients with type 2 diabetes. Trial registration Current Controlled Trials ISRCTN47464659. 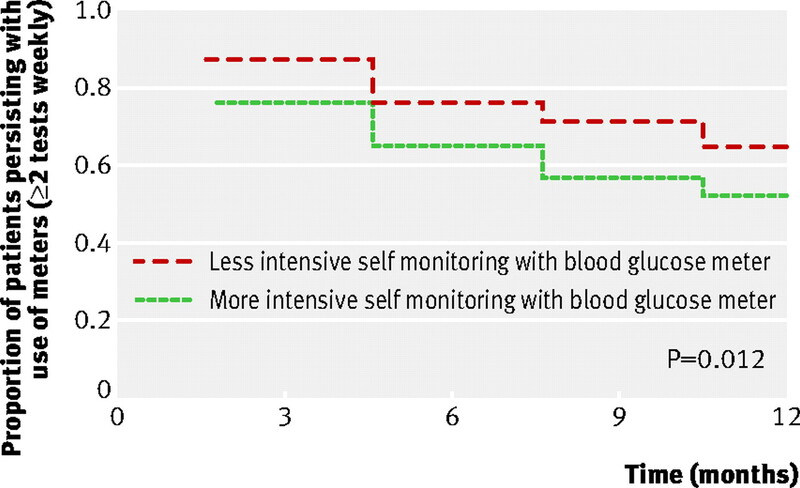 We tested whether self monitoring of blood glucose, with or without instruction in incorporating findings into self care, compared with standardised usual care can improve glycaemic control in patients with non-insulin treated diabetes. Our primary aim was to determine whether haemoglobin A1c (HbA1c) levels at 12 months were significantly different between patients with non-insulin treated type 2 diabetes receiving one of three allocated interventions: standardised usual care with measurements of HbA1c levels by health professionals every three months (control group); use of a blood glucose meter, with advice for participants to contact their doctor for interpretation of results (less intensive self monitoring); and use of a blood glucose meter with training in self interpretation and application of the results to diet, physical activity, and drug adherence (more intensive self monitoring). Patients were eligible for randomisation if they had type 2 diabetes, were aged 25 years or more at diagnosis, were managed with diet or oral hypoglycaemic agents alone, had an HbA1c level ≥6.2% at the assessment visit, and were independent in activities of daily living. Exclusion criteria were the use of a blood glucose monitor twice a week or more often over the previous three months, serious disease or limited life expectancy that would make intensive glycaemic control inappropriate, or inability to follow trial procedures. The primary outcome was the HbA1c level at 12 months. Secondary outcomes were blood pressure, weight, total cholesterol level, ratio of total cholesterol to high density lipoprotein cholesterol, and body mass index. HbA1c was measured using a Variant II Hemoglobin Testing System (Bio-Rad Laboratories, Hercules, CA) certified by the US glycohaemoglobin standardisation programme and comparable to the diabetes control and complications trial standard, with an interassay coefficient of variation across the range of the assay of less than 2%. Cholesterol was assayed in local laboratories and the results aligned with results of a sample of paired specimens analysed with an automated chemistry analyser (Olympus AU400; Olympus, Tokyo), with interassay coefficients of variation across the range of less than 2%. Blood pressure was measured twice in the right arm, with the participant seated, using a UA-779 electronic blood pressure monitor (A&D instruments, Abingdon), and the mean of these values was analysed. We transcribed the frequency of blood glucose testing from patient held diaries. Episodes of hypoglycaemia were categorised as grade 2 (mild symptoms requiring minor intervention), grade 3 (moderate symptoms requiring immediate third party intervention), or grade 4 (unconscious). Increases in hypoglycaemic drugs were defined as an increase in the dose or frequency prescribed, progression from use of a single oral agent to combination oral therapy, or addition of insulin to the treatment regimen. We used computerised randomisation (Minim, www.sghms.ac.uk/depts/phs/guide/randser.htm) incorporating a partial minimisation procedure to adjust the randomisation probabilities between groups to balance three important covariates collected at baseline: duration of diabetes, HbA1c level, and current treatment (diet, oral monotherapy, or oral combination therapy). The minimisation procedure to assign patients to their allocated intervention was conducted independently of the research nurses who managed recruitment and carried out the assessment visit. The allocation was also concealed from laboratory staff. We identified patients suitable for trial inclusion from lists held on computer by their general practitioners. Those eligible were sent an invitation to participate signed by their general practitioner accompanied by an information sheet and a reply paid envelope. One further letter was sent if no response was received within one month. Eligibility for the trial and willingness to be randomised to self testing of blood glucose was confirmed by a preassessment phone call and at the visit for assessment. At the assessment visit, after obtaining informed consent, beliefs about diabetes were elicited using a standard approach to help patients understand how diabetes might present a threat to their health.11 The roles of diet, physical activity, and drugs were discussed within the framework of the commonsense model of illness representation,11 in which we set out to optimise the use of feedback on glucose levels to facilitate behaviour change through influencing beliefs. The behaviour change techniques were selected on the basis of evidence for effectiveness and included goal setting and review of physical activity and eating patterns to help patients with lifestyle change.12 13 The goal setting and review approach was continued in subsequent visits. Baseline blood tests and clinical measurements were taken and questionnaires completed at the assessment visit. After the assessment visit and confirmation of eligibility, patients were allocated to receive one of the three interventions. The rationale behind these interventions is described in more detail elsewhere.9 The intervention was initiated at the first visit after randomisation and continued at the scheduled visits at one, three, six, and nine months. Each of the three interventions included a series of standardised components. Patients allocated to the control intervention received standardised usual care, including the use of goal setting and review. They were asked not to use a blood glucose meter unless their doctor considered it essential for their clinical management. A diary was used to record self care goals and strategies for achieving them. Patients allocated to the less intensive self monitoring intervention continued to use the goal setting and review techniques introduced at the assessment visit. In addition they were given a blood glucose meter. They were asked to record three values daily on two days during the week (one after fasting and the other two before meals or two hours after meals) and to aim for glucose levels of 4-6 mmol/l after fasting and before meals and levels of 6-8 mmol/l two hours after meals. They were advised by the nurse to consider contacting their doctor if readings were consistently high (>15 mmol/l) or low (<4 mmol/l). They were not given information about how to interpret their blood glucose readings. Separate diaries were used to record identified goals and activity and to record blood glucose results. Patients allocated to the more intensive intervention continued to use goal setting and review and were also given a blood glucose meter. They were also given training and support in timing, interpreting, and using the results of their blood glucose test to enhance motivation and to maintain adherence to diet, physical activity, and drug regimens. They were encouraged to experiment with monitoring to explore the effect of specific activities, such as exercise, on their blood glucose level and to reflect on abnormal values in an attempt to identify what might have contributed to them. A single diary was used to record goals, activities, and blood glucose results. Follow-up visits differed in content according to the allocated intervention in line with usual practice. Patients allocated to the control intervention had a blood test to measure HbA1c level two weeks before their scheduled visit, the result of which was fed back to them as an indication of the impact of their self care activities on their glycaemic control. Blood glucose values were reviewed at the scheduled visit for those allocated to self monitoring, and patients were told to seek advice from their doctor if fasting values were persistently greater than 6 mmol/l. Patients in each arm of the trial received feedback on glycaemic control, which was used to explore success of goals and to set new ones. The patient's doctor was notified of all HbA1c results and asked to consider changes in drugs in line with the National Institute for Clinical Excellence diabetes guidelines for all patients.14 The doctor was also notified if blood glucose readings were consistently greater than 15 mmol/l. The meters were calibrated to provide plasma equivalent results (Optium, Abbott Diabetes Care, Maidenhead, UK). Calibration of the meters was checked by the research nurses using a test aliquot at baseline and at six months. Data on adverse reactions or complications were collected at each study visit, together with information on the use of drugs. Training and support for the research nurses delivering the intervention was designed to ensure adherence to the study protocol.15 The nurses were taught psychological theory and trained in behaviour change techniques and skills in delivering the intervention (six days of case based training over five weeks). Intervention protocols included scripts of the topics to be covered to guide the nurses in talking to patients. Additional measures to ensure adherence to the intervention protocols included self review of taped consultations by the research nurses and external review by a sociologist. Prompts were also built into the patient diaries to help patients adhere to their allocated intervention. The trial was designed to have a 90% power to detect a difference of 0.5% in HbA1c levels as the primary end point at a two sided significance level of P<0.05. We estimated the standard deviation of HbA1c levels to be 1.5% based on a previous trial of patients with type 2 diabetes,16 and assumed a 10% loss to follow-up. We required a total of 630 patients to achieve the specified statistical power. Subsequently we revised the estimated standard deviation for HbA1c levels to 1.25% when it became clear that it had been overestimated. We retained a 10% dropout rate and 90% power and revised the recruitment target to 450 patients. We carried out a single intention to treat analysis of the main trial end points at the end of the study using analysis of covariance to compare mean levels of HbA1c at follow-up between the three allocated groups, with the baseline level of HbA1c as a covariate. If no follow-up data were available we imputed values by carrying forward the last available measurement. We specified that in the event of a statistically significant overall result, comparisons of the two self monitoring groups independently with the control group would be carried out using t tests. Levels of HbA1c over the course of the trial were compared between groups using repeated measures analysis of variance. We also estimated the intervention effect in prespecified subgroups defined at baseline as duration of diabetes (above or below median), current management (oral hypoglycaemic drugs or dietary management only), health status (above or below the median EQ-5D score), and presence or absence of diabetes related complications. We tested for effect modification using analysis of covariance. A Kaplan-Meier plot was used to explore adherence to a minimal level of self monitoring, defined as at least 26 tests over three months (equivalent to two tests each week); significance was assessed with a log rank test. The mean numbers of tests by patients carrying out at least 26 tests in each quarter are also reported, with differences between the less intensive and more intensive intervention groups compared with a repeated measures analysis of variance. 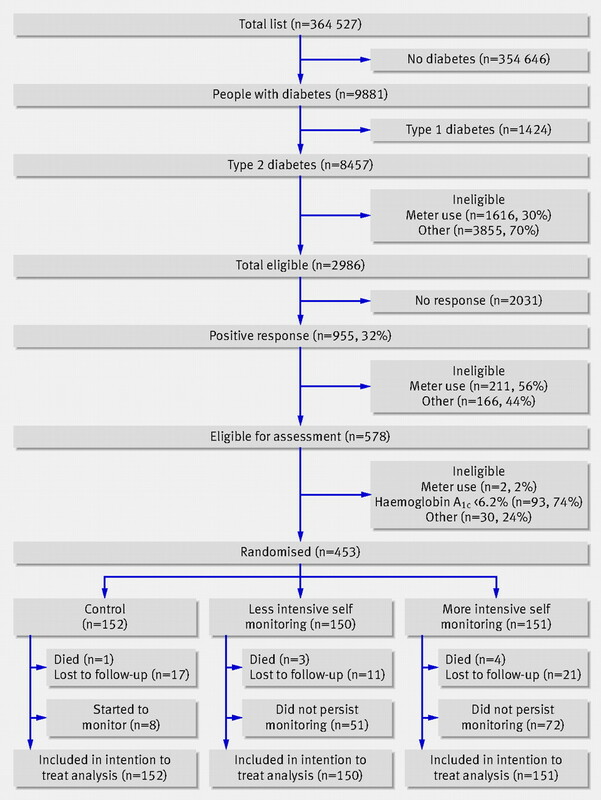 Between January 2003 and December 2005, 453 patients with non-insulin treated type 2 diabetes from 48 practices in Oxfordshire and South Yorkshire were randomised to one of three interventions (fig 1⇓): usual care (n=152), less intensive self monitoring, using a blood glucose meter and advice to contact doctor for interpretation of the results (n=150), and more intensive self monitoring, with a blood glucose meter and training in interpreting the results (n=151). The median (range) number of patients per practice recruited in 24 Oxfordshire practices was 9 (2-24) and in 24 South Yorkshire practices was 8 (3-16). Baseline personal and clinical characteristics were well balanced between the groups (table 1⇓). The median (interquartile) duration of diabetes was 3.0 years (1.8-6.4 years), mean (SD) age was 65.7 (10.2) years, and mean (SD) level of haemoglobin A1c was 7.5% (1.1). Only 57 (12.6%) patients were lost to follow-up, which did not differ between groups (fig 1⇑). Measurements for high density lipoprotein cholesterol levels were not obtained for 39 patients at baseline. At follow-up, HbA1c measurements were not collected for two patients, blood pressure for five, cholesterol levels for 10, and high density lipoprotein cholesterol levels for 15. Table 2⇓ shows the main results. At 12 months no difference was found in HbA1c levels between the groups after adjustment for baseline HbA1c levels (P=0.12). The mean difference in change in HbA1c levels from baseline to 12 months between the control group and less intensive intervention group (not adjusted for baseline) was −0.14% (95% confidence interval −0.35% to 0.07%) and between the control group and more intensive intervention group was −0.17% (−0.37% to 0.03%). Figure 2⇓ shows the change in HbA1c levels over the 12 months of follow-up, with no evidence of differences in levels between groups over the period of follow-up (P=0.38). A significant difference was found in the change in total cholesterol levels between the three groups (P=0.010). The mean difference in change in total cholesterol levels from baseline to 12 months between the control group and less intensive intervention group (not adjusted for baseline) was −0.06.mmol/l (−0.26 to 0.14) and between the control group and more intensive intervention group was −0.23 (−0.43 to −0.04). No differences were found in the other secondary outcome measures (table 2⇑). Within the prespecified subgroups no significant interactions were found with allocated group (table 3⇓). During the trial one or more grade 2 hypoglycaemic episodes were experienced by 14 patients in the control group, 33 in the less intensive intervention group, and 43 in the more intensive intervention group (χ22=18.3, P<0.001). Only one patient in the control group experienced a grade 3 hypoglycaemic episode. Patients allocated to less intensive self monitoring were significantly more likely to persist with use of the meter than those allocated to more intensive self monitoring. Ninety nine (67%) of those receiving the less intensive intervention and 79 (52%) of those receiving the more intensive intervention continued to use the meter at least twice a week for the 12 months of the study (P=0.012; fig 3⇓). Among those who continued to use a meter, the mean number of readings over 12 months was significantly higher among patients receiving the more intensive intervention compared with those receiving the less intensive intervention (P=0.022; fig 4⇓). Eight patients in the control group started using self monitoring of blood glucose. No differences were found between the groups in the proportions of patients prescribed an increase in hypoglycaemic drugs between baseline and 12 months. In the control group 45 (30%) patients had increased drugs compared with 43 (29%) in the less intensive intervention group and 48 (32%) in the more intensive intervention group. One patient in the control group, four in the less intensive intervention group, and five in the more intensive intervention group were using insulin therapy by 12 months. No differences were found between groups in the proportions of patients where hydroxymethyl glutaryl coenzyme A reductase inhibitor (statin) treatment was increased or added to therapy. Overall, 17 (11%) patients in the control group, 11 (7%) in the less intensive intervention group, and 19 (13%) in the more intensive intervention group who were not taking a statin at baseline were taking a statin by 12 months. Later papers will report on quality of life, cost effectiveness, and subgroup and more detailed multivariate analyses. 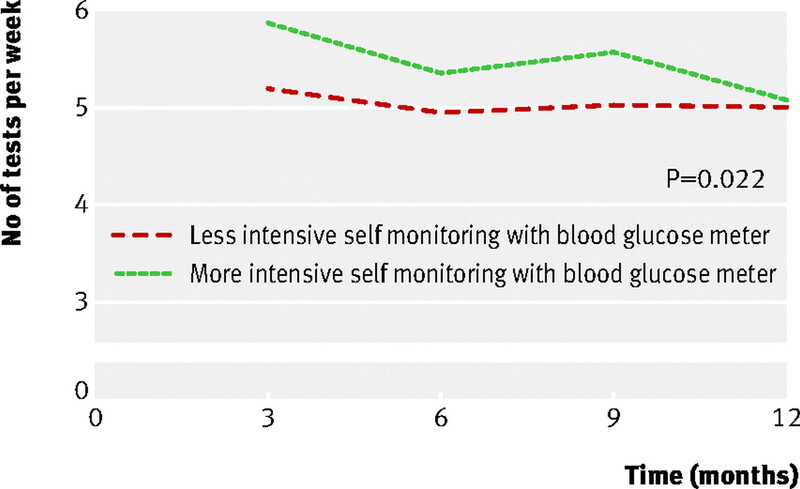 No significant improvement in glycaemic control was found after 12 months in patients with non-insulin treated type 2 diabetes using self monitoring of blood glucose levels when compared to those not self monitoring. No evidence was found of a significantly different impact of self monitoring on glycaemic control when comparing subgroups of patients defined by duration of diabetes, therapy, diabetes related complications, and EQ-5D score. Also no evidence was found that more intensive compared with less intensive monitoring led to differences in glycaemic control. Designing a trial to evaluate self monitoring of blood glucose levels is complex because it must include an educational component on the use and interpretation of testing for the intervention group,19 whereas advice on improving self care must be offered to the comparison group.3 We tackled these issues by providing a common structure for interventions, incorporating standardised good care in all three arms of the trial within which nurses discussed issues of glycaemic control, assessed either by HbA1c levels or self monitoring of blood glucose, and its role in setting and monitoring self care goals.9 The stepwise approach to the interventions across the three arms of the trial allowed examination of what aspects of the intervention, if any, were responsible for improved outcomes. Recent consensus guidelines have based recommendations for self monitoring of blood glucose levels on a theoretical potential to better self manage glycaemic control.20 21 We incorporated self monitoring of blood glucose into a framework that, based on psychological theory, should have optimised its effect. Careful specification, training, and monitoring of consultations ensured that the allocated interventions were delivered as planned,22 although some patients in the less intensive intervention group may themselves have adopted a more intensive monitoring approach. Despite an intervention based on standards of best clinical practice and underpinned by appropriate psychological theory, we found no convincing evidence of an effect on glycaemic control. Fewer people in our trial allocated to more intensive self monitoring compared with less intensive self monitoring continued testing; previous studies have found that trying to understand blood glucose measurements may lead to frustration when results do not fall into a pattern, or cease to be of interest when they are entirely predictable.27 Patients with reasonably well controlled diabetes do not need active encouragement to use a meter. The increased recording of hypoglycaemia in the self monitoring arms may be a result of an increased awareness of low blood glucose levels from using the meter rather than a true biochemical difference between groups. Although no improvement in glycaemic control was observed, a small but significant improvement was found in total cholesterol levels with the self monitoring intervention. This finding is consistent with an increased intensity of self management in these groups, possibly mediated through increased dietary adherence or through taking lipid lowering drugs more regularly. Recent systematic reviews have estimated a benefit of 0.4% from self monitoring,2 and on this basis a previous study has estimated an incremental cost of £4500 (€6650; $8880) to £15 515 per quality of life year gained. Our estimates of the size of effect on HbA1c levels suggest that it is probable that the previous study underestimated the cost per quality of life year gained. A comprehensive economic evaluation with cost effectiveness estimates will be detailed in a future report. Evidence of benefit from self monitoring of blood glucose for other patient groups is stronger. Large trials of management of patients with type 1 diabetes have incorporated self monitoring of blood glucose as an essential part of self management.28 29 Self monitoring for insulin treated patients with type 2 diabetes is accepted practice, although the evidence base requires further work and optimisation of its use may be possible. However, routine self monitoring of blood glucose for patients with reasonably well controlled non-insulin treated type 2 diabetes seems to offer, at best, small advantages; is not well accepted; and the cost, effort, and time involved in the procedures may be better directed to supporting other health related behaviours. Current guidelines for the use of self monitoring of blood glucose among patients with reasonably well controlled non-insulin treated type 2 diabetes should be reviewed. We thank the patients who took part in this study and their doctors for support and help. W Hardeman and I Hobbis contributed to the development of the intervention protocols and prepared and led some of the training sessions for the nurses. M McKinnon and J Donnelly helped train the nurses and L Rosmovitz carried out external review of interventions. Contributors: AF, A-LK, and AN had the original idea for the study and wrote the trial protocol with PY, DF, and RH. AF, AW, DF, and A-LK developed the trial measures and intervention. PY was trial statistician and analysed the data. AW, AF, AC, and EG managed the trial. AF wrote the first draft of the manuscript with AN and A-LK and all members of the writing group reviewed and commented on the final manuscript. AF is guarantor of this paper. The DiGEM Trial Group. Writing committee: AF, AW, EG, PY, DF, AC, RH, A-LK, and AN. Investigators: AF, AN, A-LK, D Mant, S Ziebland, DF, A Gray, PY, and RH. Steering committee: N Stott (chair), AF, AN (to 2005), S Sutton, H Tewson, D Chapman, H Hearnshaw, E Goyder (from 2005), P Glasziou (from 2005), M Jiwa (2004 to 2005), and M Gordon (from 2005). Intervention development: AW, AF, DF, A-LK, and MP Selwood. Coordinating Centres: (Oxford) AW (to 2005, trial coordinator), AC (trial manager), PY (trial statistician), J Simon (health economist), and A Fuller (data manager); (Sheffield) Vivienne Walker (local trial administrator). Data monitoring committee: C Baigent (chair), J Levy, and K Wheatley. Research nurses (Oxford) MP Selwood, H Kirlow, M Chapman, and S Turner; (Sheffield) A Casbolt, K Dobson, A Willert, A Roberts, and H Wood. Central laboratory: K Islam. Funding: The trial was funded by the NHS and the National Insitute for Health Research health technology assessment programme. The opinions expressed in this report are not necessarily those of the Department of Health. Abbott Diabetes Care provided blood glucose meters (Optium). AF was supported by an NHS research and development career development award from 2001-5. AW was supported by a Rhodes scholarship. Ethical approval: This study was approved by the Oxfordshire Research Ethics Committee B (002.059). Coster S, Gulliford MC, Seed PT, Powrie JK, Swaminatham R. Self-monitoring in type 2 diabetes mellitus: a meta-analysis. Diabet Med 2000;17:755-61. Welschen LMC, Bloemendal E, Nijpels G, Dekker JM, Heine RJ, Stalman WAB, et al. Self-monitoring of blood glucose in patients with type 2 diabetes who are not using insulin: a systematic review. Diabetes Care 2005;28:1510-7. Sarol JN Jr, Nicodemus NA Jr, Tan KM, Grava MB. Self-monitoring of blood glucose as part of a multi-component therapy among non-insulin requiring type 2 diabetes patients: a meta-analysis (1966-2004). Curr Med Res Opin 2005;21:173-84. Karter AJ, Parker MM, Moffet HH, Spence MM, Chan J, Ettner SL, et al. Longitudinal study of new and prevalent use of self-monitoring of blood glucose. Diabetes Care 2006;29:1757-63. Martin S, Schneider B, Heinemann L, Lodwig V, Kurth J, Kolb H, et al. Self-monitoring of blood glucose in type 2 diabetes and long-term outcome: an epidemiological cohort study. Diabetologia 2006;49:271-8. Farmer AJ, Neil A. Variations in glucose self-monitoring during oral hypoglycaemic therapy in primary care [letter]. Diabet Med 2004;22:511. Davidson MB. Counterpoint: self-monitoring of blood glucose in type 2 diabetic patients not receiving insulin: a waste of money. Diabetes Care 2005;28:1531-3. Farmer A, Wade A, French DP, Goyder E, Kinmonth AL, Neil A. The DiGEM trial protocol—a randomised controlled trial to determine the effect on glycaemic control of different strategies of blood glucose self-monitoring in people with type 2 diabetes [ISRCTN47464659] . BMC Fam Pract 2005;6:25. EuroQol Group. EuroQol: a new facility for the measurement of health related quality of life. Health Pol 2001;16:199-208. Leventhal H, Nerenz DR, Steele DJ. Illness representations and coping with health threats. In: Baum A, Taylor SE, Singer JE, eds. Handbook of psychology and health. Hillsdale, NJ: Erlbaum, 1984:219-52. Strecher VJ, Seijts GH, Kok GJ, Latham GP, Glasgow R, DeVellis B, et al. Goal setting as a strategy for health behavior change. Health Educ Q 1995;22:190-200. National Institute for Clinical Excellence. Management of type 2 diabetes: management of blood glucose. London: NICE, 2002. Hardeman W, Sutton S, Griffin S, Johnston M, White AJ, Wareham NJ, et al. A causal modelling approach to the development of theory-based behaviour change programmes for trial evaluation. Health Educ Res 2005;20:676-87. Bergenstal RM, Gavin III JR. The role of self-monitoring of blood glucose in the care of people with diabetes: report of a global consensus conference. Am J Med 2005;118(9, suppl 1):1-6. Gerich JE. Clinicians can help their patients control postprandial hyperglycemia as a means of reducing cardiovascular risk. Diabetes Educator 2006;32:513-22. Franciosi M, Pellegrini F, De Berardis G, Belfiglio M, Di Nardo B, Greenfield S, et al. Self-monitoring of blood glucose in non-insulin-treated diabetic patients: a longitudinal evaluation of its impact on metabolic control. Diabet Med 2005;22:900-6. Owens DR, Barnett AH, Pickup J, Kerr D, Bushby P, Hicks D, et al. Blood glucose self-monitoring in type 1 and type 2 diabetes: reaching a multi-disciplinary consensus. Diabetes Primary Care 2004;6:398-402. American Diabetes Association. Standards of medical care in diabetes-2006. Diabetes Care 2006;29(suppl 1):S4-42. Bellg AJ, Borrelli B, Resnick B, Hecht J, Minicucci DS, Ory M, et al. Enhancing treatment fidelity in health behavior change studies: best practices and recommendations from the NIH Behavior Change Consortium. Health Psychol 2004;23:443-51. Davidson MB, Castellanos M, Kain D, Duran P. The effect of self monitoring of blood glucose concentrations on glycated hemoglobin levels in diabetic patients not taking insulin: a blinded, randomized trial. Am J Med 2005;118:422-5. Guerci B, Drouin P, Grange V, Bougneres P, Fontaine P, Kerlan V, et al. Self-monitoring of blood glucose significantly improves metabolic control in patients with type 2 diabetes mellitus: the auto-surveillance intervention active (ASIA) study. Diabetes Metab 2003;29:587-94. Schwedes U, Siebolds M, Mertes G. Meal-related structured self-monitoring of blood glucose: effect on diabetes control in non-insulin-treated type 2 diabetic patients. Diabetes Care 2002;25:1928-32. Norris SL, Lau J, Smith SJ, Schmid CH, Engelgau MM. Self-management education for adults with type 2 diabetes: a meta-analysis of the effect on glycemic control. Diabetes Care 2002;25:1159-71. Peel E, Parry O, Douglas M, Lawton J. Blood glucose self-monitoring in non-insulin-treated type 2 diabetes: a qualitative study of patients' perspectives. Br J Gen Pract 2004;54:183-8. Diabetes Control and Complications Trial/Epidemiology of Diabetes Interventions and Complications (DCCT/EDIC) Study Research Group. Intensive diabetes treatment and cardiovascular disease in patients with type 1 diabetes. N Engl J Med 2005;353:2643-53.